FORMAT: 3CD, 2DVD 1Blu-Ray Limited edition tour version boxed set! • Two DVDs featuring the full concert performances in stereo & 5.1 surround sound. • Expanded, perfect bound, booklet: 36 pages with additional tour photos. • Six disc set presented in two triple digi-packs with booklet housed in an outer slipcase. This is King Crimson....re-imagined.‘ - Robert Fripp, June 2016 A comprehensive and immersive account of the 2015 live incarnation of the ever evolving entity that is the mighty King Crimson. 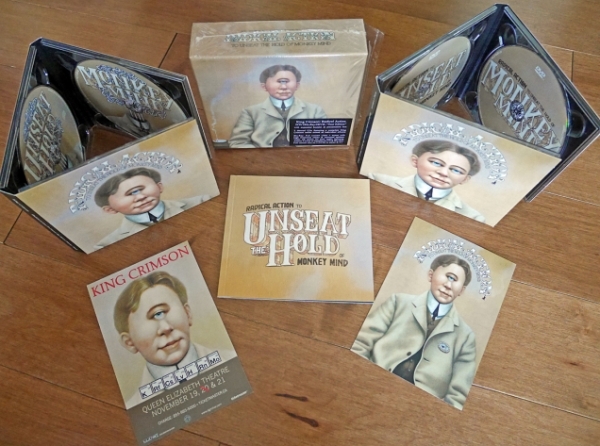 Featuring a 36 page booklet and presented in two double digipaks in an outer case, this limited edition version of Radical Action includes: Three CDs - presented as individually themed ‘virtual studio albums‘ with no audible audience - featuring a representative example of every song/piece performed by King Crimson on its 2015 tours of the UK, Canada and Japan. Two DVDs featuring a complete filmed concert performance in stereo and 5.1 surround Blu-Ray featuring a complete filmed concert performance in high-resolution stereo and 5.1 surround audio. Also contains ‘picture off‘ mode, allowing the music to be heard independently in pristine, lossless audio (24/48khz as per original recordings). Expanded, perfect bound 36 page booklet with additional tour photos.